This Queen is practical. She spends many hours supervising the cultivation of her gardens and the crops in her fields. Although she’s a powerful Queen, she exercises that power within her own domain, making sure that her castle and properties are maintained and her people are comfortable, safe, and well-fed. She doesn’t engage in the dreamy emotionalism of the Cups, the unbridled fiery passion of the Wands, or the elaborate strategies and machinations of the Swords. She takes one thing at a time, one day at at time. She’s the most grounded of the Queens. 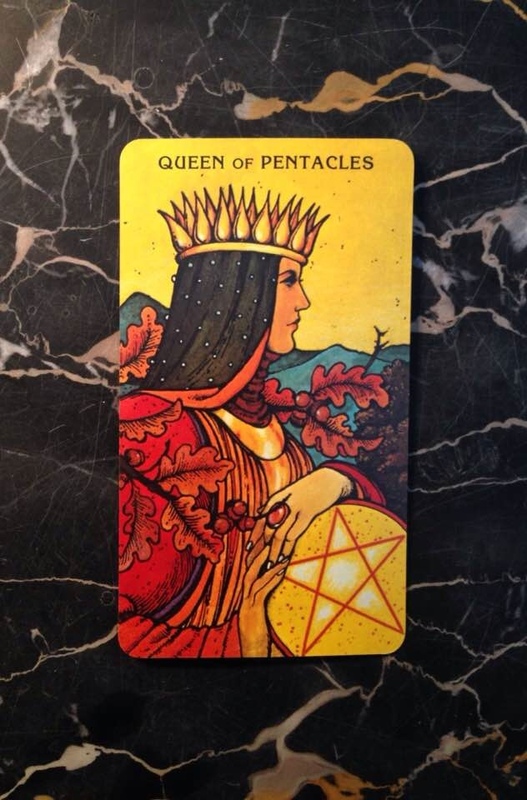 This card comes up today to suggest that you try to develop her qualities within yourself. See where they could prove useful in your life right now. If you’ve been indulging in too much brainstorming, competitiveness, or distraction with romantic fantasies, bring yourself down to earth and focus on getting important stuff done.